A top executive on vacation at a Mexican beach watches a fisherman get up late every day, work a few hours, eat lunch, sleep in the afternoon, and party in the evening with his amigos (friends). The ambitious executive is very restless so he asks the fisherman: Why do you go fishing only for a few hours? Executive: Well, you can work double the number of hours, earn double, get another boat, then two, then open a company…then take the company public…then you will be rich! Fisherman: Okay. How long will that take? Executive: About ten to fifteen years. Fisherman: After all that hard work, then what? Executive: Then you can retire! 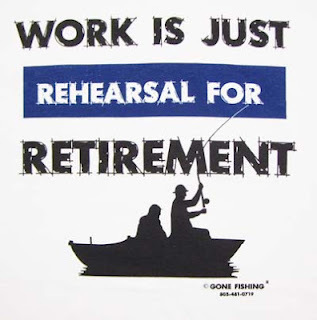 Fisherman: Retire and do what?